Labour would extend workers' rights and "restore the balance of power in the workplace", shadow chancellor John McDonnell has said. He promised more rights for people working in the so-called gig economy. In a speech to the Trades Union Congress in Manchester, Mr McDonnell said a "new workplace environment" would boost productivity. The Tories said unemployment was at an all-time low with millions of low-paid workers given a pay rise. A government report published in February found about 2.8 million people had worked in in the gig economy in the previous year, most commonly 18-34 year olds in the London area. Supporters say many workers like the flexible hours and short-term contracts on offer but Mr McDonnell said they have contributed to "a workplace environment of insecurity not seen since the 1930s". 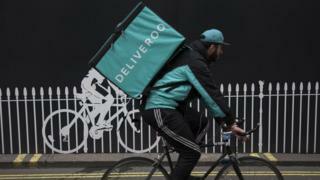 Under a future Labour government, he said workers in the gig economy could be given similar rights to those in permanent work, including eligibility for sick pay, maternity pay and similar benefits. His other proposals include allowing collective bargaining across different sectors of the economy and introducing employee ownership funds - under which staff at larger companies would be given shares in order to give them a stake in the profits and management of firms. "Our programme of workplace reform will restore the balance between employer and worker and it will do so by installing basic trade union rights in law again, modernising corporate governance structures and extending the opportunity for employees to share collectively in the benefits of ownership of their company," he said. A Labour government would ban zero hours contracts and introduce a "real living wage" of £10 an hour, as well as scrapping "anti-trade union" laws, he told the TUC. Mr McDonnell, who received a standing ovation from trade unionists at the end of his speech, did not rule out backing a second EU referendum - as the TUC says it wants - but said his preferred option was a general election. In a wide-ranging speech, he said he believed a general election "could come at any time" and Labour was working on detailed economic planning and policies for its first Queen's Speech. A Labour government would set up a new department for employment to "transform" the workplace, putting the "principles of trade unionism right at the heart of it," he promised. He also pledged to join railway workers on the picket line if they launch winter strikes. Earlier, in an interview with BBC Radio 4's Today, Mr McDonnell said there was a huge group of people who were doing multiple jobs and still only "just about surviving" because of low wages. He dismissed claims that extending union rights and employee ownership could destroy jobs - arguing they were needed to stop exploitation and create a civilised society. "If we want people treated fairly at work, we should have equal rights and from day one," he said. The BBC's assistant political editor Norman Smith said the Labour leadership believe the sort of radical polices being outlined would appeal to a much wider swathe of voters ahead of a general election which they believe could be only months away in the event of a disorderly Brexit. But Chancellor Philip Hammond hit back, saying: "This is Labour's record on workers - the last Labour government left over half a million more people out of work, and every Labour government leaving office with unemployment higher than when it started." The Institute of Directors, said employee ownership already existed as a business model, with tax incentives on offer to firms to encourage greater worker participation. "Labour's proposal seems to cross the line between encouragement and coercion," the business group said. "Different company structures have different pros and cons, and directors are best placed to decide what is in their organisation's best long-term interests."